Dr. Kishore Kumar Vatwani is working in ASG Eye Hospital as Glaucoma surgery specialist. 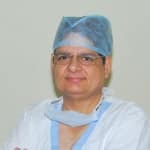 Dr. Vatwani is having vast experience of doing Glaucoma surgeries. I am suffering from myopic in left eye .i have undergone a laser surgery in 2012 .i want to know that can I get my eyesight normal. I am suffering eye pain and my head also paining because of eyes how can I be free from these pain. For pain take tablet paracetamol 650 mg and I will suggest you to buy a steam inhaler machine of crescent company and take a flow of steam (of plain water only) over the forehead through the inhaler and can repeat the process after eight hours as and when required. Showing a black dot in my right eye. Its very small. Its not showing in every time. It visible in looking any bright objects. Its started around last two or three months, I do not know the exact time. Please help me. Your black dot can be a floater. It is harmless and very common. They represent tiny clumps of dead cells which originally come from the layers of tissue at the back of the eye and 'float' about in the fluid in the centre of the eyeball itself. As time passes you will get used to them and hardly notice them. Do consult a opthalmologist for confirmation and to rule out any other pathology. What type of blood test suits for me if I have PE, ED, Thin Sperm, looking aged, hair lose, weak body, pimple problem, gaining fat, hair white, gaining weight, weak eye sight. Thanks. Instead of undergoing blood tests. Why don't you consult a physician or family doctor for your concerns. For weak eyesight you will need to get a comprehensive eye examination done. Most of it will be OK if you follow 4 pillars of good health- good nutritious diet exercise adequate rest n relaxation positive mental attitude. Today morning when I got up I noticed that my eyes were red then as the day passed they turned a little more red I washed them with cold water many times but there was no relief I even wshed with rose water but no relief. Yesterday I had gone for facial n I felt that a lot of cream had entered into my eyes n I was feeling a bit of irritation what can I do. Hello you can 1. Blink a lot 2. Wash eyes with fresh water 3. Cold compresses 4. Use lubricating eye drop like flogel and I -KUL PLUS This is a provisional diagnosis. Consult your ophthalmologist for detailed examination. My mother is 63 years old, having to undergo cataract extraction. I want to know, which is one is the best multifocal or monofocal IOLs. She is also diabetic. Mr. lybrate-user, Thanks for the query. First and foremost is to keep her blood glucose in strict control (fasting < 100 mg, PP 150 to 170 mg & HbA1c% <7). +Choice of lenses depends on one's affordability. All are good. Multifocal does not offer any grade advantage. Thanks.